Etch a Sketch was created by a French inventor in 1955, according to a business “Briefing” in the Fort Lauderdale Sun Sentinel, February 13, 2016, bought by Ohio Art in 1960, and has now been sold to a toy company in Toronto, Canada. It is considered a “surprise move.” This Grandma wonders why. I remember playing with Etch A Sketch as a child. I have purchased Etch a Sketch for our children and grandchildren. It does not appear as an Oppenheimer Toy Award Toy on Toy Portfolio. I guess because it is a ‘classic,” as we grandmas are. It requires no batteries, has no electronics, and allows creativity and imagination to shine through. It is still a number one best seller on Amazon though. I have even purchased the pocket size for camp packages. It seems that doodle art has evolved and Ohio Art had a big part in the evolution. So, Ohio Art Company sold Etch A Sketch and its spinoff, Doodle Sketch to Spin Master Corporation. Doodle Sketch is the next generation of imagination art. It even comes in a Frozen version. Another effort by Ohio Art, Magna doodle, is an Oppenheimer Award Winner, a classic and gets their Blue Chip (classic award). Doodle Sketch does not appear as an Oppenheimer Toy Award Toy on www.toyportfolio.com. Bells and whistles are what the grandchildren now want. And more companies have come into the mix in this arena of clean doodle art. If you fast forward to 2014 Oppenheimer Toy Award winners in doodle art, Creativity for Kids, a great company for encouraging imagination has three doodle winners: “Tape a Doodle Fashion Designer,” for ages 6-15. Buy at Amazon. Tape a Doodle Extreme, for the same ages available at Amazon; and Tape a Doodle Arts and Crafts, for ages 7 years and up and the highest rated of the three on Amazon. This Grandma loves the hands on, cutting, taping, drawing, creation of the evolution of our classic toy. 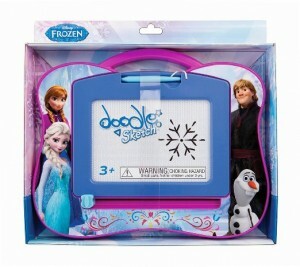 But, advancements in doodling have now come to doodle apps on electronics! Our grandchildren like their creativity and imagination in one place–one electronics. And most of the apps are free. And for all ages. Explore on The Itunes App Store.